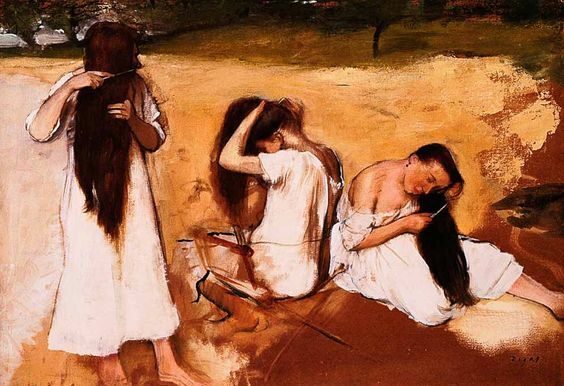 Women Combing Their Hair, 1875-76, Edgar Degas (French, 1834–1917). I’m letting my hair grow out. Like a girl again. It’s past my shoulders already, still mostly brown with a few shimmers of light woven through. I don’t feel old. Few of us do, even while seeing the signs. When I was young, I always felt young. Too young. Young in a lost, vulnerable, deer-in-the-headlights sort of way. I could never understand how other children, teens, young women, seemed so confident, sounded so sure of themselves. When everything about me felt tentative, like I was only half-made, not fully formed, still waiting for some sense of wholeness to emerge. I felt too-young even when I wasn’t. When I should have known better. When others were counting on me being full-grown. Like my children. Other young mothers seemed so secure and self-assured in their mothering, in their interactions with the adult world they inhabited. It was always a mystery to me, how they did that, how they could slip so comfortably into something that was clearly beyond me. With my own children, at one level, we were one. When they were in my arms, on my lap, when we rocked and thrummed together, they were more me, more mine, more us than anything I had ever known. The circle was complete. I was all womb then. Part of some great mothering movement that wound round us. We were one, not two. But when they stepped away, when we stood face to face, two again, these little people, staring back, startled me. They were like exotic flowers from some distant land who had been plucked and placed, amazingly, in my hands. Under my care. A person who had no idea what she was doing, who was improvising all the way, first this, then that, no gut-level knowing to clue me in. Not a mother at all. Just this over-grown girl play-acting at best. Even my children, I’m sure, knew. But they played along. I’ll be the mother and you be the children, we agreed. Sort of. Sometimes. The line blurred. Lots of give in our roles. But we grew into them eventually. Somewhere along the way I became mom. The sense of wholeness I had been waiting for settled around me and I can’t really point to the moment I knew I was fully grown, at last. I do not feel young now. But neither do I feel old. I feel somewhere in-between, swaying cozily in some hammock strung between the two. It feels wide open. I don’t feel the years bearing down. I don’t feel something precious slipping away. I feel right, at last. And wide open. Beautiful, Deborah. And so true for many of us. Love this. I’m right there with you – although my gray has definitely asserted itself over the rest of my color and I’ve decided my never luxurious locks just look too scraggly to be longer than chin length. But I don’t feel old either – so it’s shocking to sometimes get a glimpse of myself in the mirror at a certain angle and realize- neither am I young. I know, Tricia, what I see in the mirror doesn’t match how I see myself in my mind. I’m liking my long hair which is thick and wavy although sometimes it looks rather wild. I’m learning how to do classic rolls for when I want to get it out of my way. Wonderful, and I love your description of motherhood. I was feeling old and rather lost of late, but we recently moved West, after talking about it for quite some time, to Bend, Oregon. Stressful, but now it seems to be making a difference, and now that spring/summer is here I feel like a different person. Went back to NYC for an unexpected, quick visit, where I spent my younger days, and was so glad to still feel comfortable and energized there. Am looking forward to diving deep into creative work, which your blog helps me so much with! You sound wonderful, energized! Sometimes we need to shake up our lives, move out of those old grooves, and it sounds like you’ve done that. I can’t wait to hear more about you new creative work! That is gorgeous, Joy. Your comments deeply moved me. It is true how having grandchildren helps to free that inner child, and reaching that age in life where others expectations of us diminish frees a space for us to just be who we always were rather than trying to be what we and others thought we should be. I love your line about expanding our minds further than our waistlines, so funny, and true! And about that latent creativity which we are free to explore and reflect. Your last line about the hammock and life’s rhythms–perfect. You’ve completed the metaphor I began and was leaning toward in my post: that gentle rocking toward all we’re intended to be. May it rock away all the pains of our past and present that have no part in our true being. Much love to you. Love that you’re entering what sounds like a time of ripeness–of things waiting in the ether to be discovered and come to fruition . .. Thank you, Kay. I like that–a time of ripeness. Yesss…to grow back those long tresses and feel free in doing so! It’s strange, isn’t it, how our deepest, most personal responses to life find resonance in other people’s lives, like at some level, some of us at least, are on the same or similar wave lengths. I love it when that happens. Thank you, Laura. I am past where you are but really appreciate your words. Keep writing. I completely identify with everything you wrote here. Your writing voice is authentic and sincere. Thank you. Thank you so much! I think there are a lot more out there like us than we know. This really pulled me in! You started with an opening that summed the whole thing up. Genius! And then – you gently lulled us into the depth of understanding into a 5 second pause of a middle-aged woman looking into the mirror and sensing she has arrived in understanding and is assured of herself. Wow. Just Wow. Thank you, Kim! i’m so glad you enjoyed this. You really made my day. Excellent. No children but if I had them, this is how I’d feel. Thank you, Manja! I love it when people relate to what I’ve written.